At Bazaarvoice, we believe that human connection should be at the heart of all interactions between people and businesses and that shopping online should be just as social as shopping in-store. Ratings and reviews were the first step in bringing this authentic dialog between consumers and brands online, but reviews comprise only a small percentage of the conversations going on about your brand and products. Today, nearly 75% of all Internet users are active on social channels—sharing opinions, ideas, thoughts, and pieces of their lives on social networks. Social channels like Instagram, Facebook, and Twitter have empowered more people to participate in the conversation and they’re talking about your brand at soaring rates. 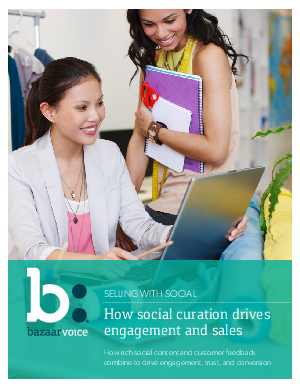 Download “Selling With Social: How Social Curation Drives Engagement and Sales” now to learn how to build engaging experiences on your site with high-quality, relevant social content—driving engagement, trust, and sales.